thank you for covering this so thoroughly! I tend to track CO2 relentlessly, but I just post the numbers with commentary, it’s helpful to have the raw data punched in to a post that covers the bigger picture. Well, it’s certainly not freezing very fast. We only added 50,000 square kilometers yesterday — at a time which usually sees x2 or x3 that refreeze rate. Creates sideways movement in the graphs. And, yeah, we’ve had daily loss blips in some of the monitors. This is a reason why CO2 concentrations are increasing faster and faster. And, of course, the destructocrats keep killing trees, too. The Tasmanian Liberal regime has just decided, with customary good grace, to renege on the forestry ‘Peace Plan’, agreed to some years ago, and resume logging in areas like the Tarkine forest, the largest temperate rain-forest left in the country. They can’t help themselves-they were born and bred to destroy. Great post, Robert. I think this increase in the rate is really important for people to understand. Today’s rate of increase is more than 100 times faster than the increase at the end of the last ice age. When people deny that humans could impact the climate, they just need to look at the long term small variations in CO2 levels over thousands of years and then look at the Mauna Loa chart from 1956 on. There’s no way such a rapid increase couldn’ t have a profound impact. Oh wait…those greedy scientists are just fudging the data, no need to worry. The ‘greedy’ scientists are often so conservative that they have more in common with people who stand in shocked and honest disbelief of the radical changes now taking place. I’m not talking about cynical deniers who do so for short term political and monetary gain — trading a brief profit for hell on earth. I’m talking about the poor fools they duped because they wanted to believe in kinder fates. No, the scientists have been very cautious. Which is one reason why I sometimes tend to upset them. RS sometimes the best way to find all the bad apples is to upset the apple cart. Keep tipping apple carts please. Hah. Well, I couldn’t in good conscience hold back. My experience is that overly cautious types get surprised by events. You have to venture out into unknown territory if you want to make real progress in understanding. That’s risky. But there’s nothing learned otherwise. I rather think that the downplaying of reality by the climate science Establishment will be as much responsible for our fate as the actions of the denialist industry. Even now, they are basically silent, and we must wait years for the next IPCC Report, which on past experience (and because it will be dumbed-down by the likes of Saudi Arabia and Australia)will not be an accurate reflection of just how dire things really are. In any case, wonderful points here, June. You’re right. Approx 100 ppm CO2 increase at the end of the last ice age = 1 ppm per century. We are 330 times that rate in 2016. Here is sea-ice extent now. This is very scary. The freeze refuses—fails—-to engage? Meanwhile, over at the DMI, the daily mean temp north of 80 continues to stagger zombie-like off the beaten path. Arctic is scary – what with the state of the ice at the end of the melt season (largely broken up, almost no thick, multi-year ice left) – the greatly expanded extent of open water during the spring, summer, and now fall months – and the refusal to refreeze – I think we have crossed a line! And this (the Arctic) is the main driver for almost all northern hemisphere weather. Eric Holthaus is challenging DiCaprio to stand by his fine words about practicing what we preach and to make a public pledge to fly less. “We have to practice what we preach.”@LeoDiCaprio, 36:05, #BeforeTheFlood. This makes me a bit twitchy. Is there a precise personal emissions level at which forbids you to have a view? It is the message which is the important thing. I think the film encourages viewers to pay a voluntary carbon tax, so I would be surprised if yer man hasn’t already addressed this issue in publicity interviews for the film. It would be interesting to know how he answered this rather obvious criticism. Yes, it would be interesting to see if he responds. And not to defend him, but Holthaus seems to be generally concerned with the popular (mis)conception of environmentalists as people who have no problem telling others what to do while *appearing* not to follow their own advice. This is certainly a common criticism of David Suzuki here in Canada, for example. Suzuki’s credibility among a certain large segment of the population suffers as a result of an apparent hypocrisy. Yeah, but please note that according to these same trolls/critics, you would qualify as a hypocrite for using your computer or any other activity that depends to any extent whatsoever on fossil fuels. They were bitching about those of us who went to the NYC climate demo a couple of years ago because we took, gasp, buses. Meanwhile, all of the celebrities who behave the same way as Leo, but don’t do anything about climate change and don’t talk about it at all, get a free pass. I think Eric is great for not flying; Kevin Anderson, too. But I wouldn’t join the Koch crank tank choir in publicly calling out climate activist celebrities for their failings. I’d say odds are that Leo has inspired far more than enough action by others to counterbalance his own carbon footprint. Hypocrisy is the cry the right wing raises when it has no substantive response to the science. MHO. Well said. These kinds of criticisms just feed the opposition. We should keep our eyes on the prize Leo did a great thing here. This can kinda turn into a witch hunt. We should resist that. It’s one thing to encourage good behavior and setting an example. It’s another thing to turn into the thought police. For example, if DiCaprio voluntarily set a limit to his air travel as a way of setting an example, then he should be applauded. But shaming him for what he hasn’t done even as he promotes a very helpful set of responses isn’t a very productive path forward. We should all, absolutely be doing everything. But going hyper-negative on individuals isn’t helpful. I agree in the sense that we shouldn’t become the ‘all who fly are bad’ police ala animal farm. The most important thing is to push the policies that will discourage carbon emissions and directly shut them down. That’s what has the broadest effect and that’s where this film is right on the money. I don’t necessarily think that Holthaus was going in that direction. But we should resist that particular tendency. well said Robert and Cate and climatehawk1, I was wondering why I was a bit uncomfortable with Holthaus’ argument, even though it makes sense in a lot of ways. I kind of think it’s self reinforcing loops of individual and collective action that get a thing turned around. North American people need to move to the city and take transit more, and it has to become part of the more people’s conversations that living in a walkable neighbourhood is a good thing, but the city planners need to prioritize walkability over car throughput, and the elected officials have to direct the planners to prioritize walkability, and the elected officials have to be pushed by their constituents to provide that direction, so that comes back to people’s conversations. I think Kevin Anderson posted a link to a short essay about us needing both individual and collective actions, but I think you’re all right here to caution us not to start a circular firing squad / witch hunt. The bigger picture is more important, and people doing something (working on and promoting a documentary that can carry the conversation to a wide audience) is what’s most important. People seeing that those around them are doing something helps them to do something too, and famous people making those conversations ok helps a lot too. That’s my guess anyway. carbon tax would greatly reduce the air travel issue and impact. Will we do it? I don’t think so. Neither president candidate is supportive. That would certainly help to cut his individual emissions. Not gonna happen isn’t going to cut it. We all need to do everything we can to pitch in now. And that’s the positive side of individual response we should be leaning into — notable acts by individuals with a high visibility is a form of climate leadership. And I absolutely think that this is what Holthaus had in mind when he made his comment. Another thing to remember with regard to Leo is that he is trying to wake people up to the urgency of the situation, and I think that in cases such as this, being constrained by the narrow options of the FF world, flying still is better than not trying to educate large numbers of people. If even a small number of the millions of viewers start being more open to policy changes and to making small changes in their own lives, then it has some benefit. The same is true, in my opinion, for scientific conferences. Videoconferences have their uses, but those of you who have been to large national or international conferences know that the personal interactions as well as education that take place are extremely valuable. I agree. If you can’t make people aware then it defeats the whole purpose. The issue is that we need systemic change to deal with climate change. Individual change helps, but it’s changing entire systems, the entire way that we do business that helps the most. And this was the broader thrust of Leo’s work and one reason why I absolutely, wholeheartedly support what he is trying to do here. Thanks, once again for this. CO2 concentrations are the most important numbers in this evolutionary and even geological epic. But few actually know or follow them. And they need context, which you provide here so masterfully. Keep it up. Maybe a once a fortnight or at most once a month update on these numbers with context would be of value to all? Thanks, Wili. I generally hit this about every other month unless there is something concerning in the data. This year things went off the rails because there was just so much to cover. But an approx 3.35 ppm annual increase for 2016 is a big deal and worth a heads up. This post. The importance of it. This is outstanding work Robert and I hope that there are many folks out there that have the light bulb go off in their head because of this post. You really show just how much work must be done and how little time there is to do it before the thermostat is taken out of our hands and the serious feedbacks gain control. Full blown emergency for humanity. Anyone that thinks different needs to read this again. There’s quite a bit between the lines in this one. I tried to keep my own voice out of it, but it’s tough to when what’s happening is so outrageous. This rate of initial carbon forcing — the Earth has never seen anything like it. Many thanks Robert, for another well written and significant article. Too many seem to think that the slow linear calculated increases are not of immediate concern, but now we seem to be accelerating upwards and the other things we measure all respond in unison, unfortunately. Soon all of us will have to be concerned, deeply concerned. We must realize that things like sea level rise wont stay in a near linear rise for ever. It didn’t in the past, even without mankind’s artificial alterations to natural balance, so why should it in the future. Sea level rise is already on an exponential curve. We’re still in the low portion of the ramp. 1.5 to 2 C global appears to be the threshold where things start to really shake loose when it comes to glacial expansion of sea level rise rates. We’re approaching the lower boundary now and will start to see those impacts in the next two decades. Very off topic, but (for those in the U.S.A.) what is the feel in the US right now about the state of Trump’s campaign? It is horrifying for me here to think he is even a remote chance, but our media is fully wishing he gets elected (including our own ABC unfortunately). With republican’s holding the balance, surely it will be end game for the planet if he wins? I know here in Oz we all had a feeling that Turnbull would just hold on, and he did…(although it is such a slim majority that he is really a lame duck for his entire term). Also, has there been any mention of security measures and accountability for electronic voting systems this time around, given the rather well publicised attempts to rig the voting last election? If Trump does’nt score the electoral college vote it could well be the Congress choice and that may not be Trump. When he left the Agency, McMullin went to Wharton Business School (Trump’s alma mater) and then got a job at Goldman Sachs before moving on to work for the Republican Party, where he rose to become the chief policy officer for the Republican Congressional Conference. He quit that role due to his dismay over Trump’s rise in the party. Also for this to happen he would have to stop Clinton from getting 270 electoral votes? (if my understanding is correct) and given this state is as republican as it gets, surely this would mean that Trump would be faltering and making Clintons role easier? And also……. it seems to me that Utah is now a three horse race and if the two right wingers split their vote enough, maybe Clinton can pass them? Does the Presidential election use preferences or is it solely who gets the most votes? Is Clinton close enough to pick up Utah as a fluke? Trump does have a chance now. And republican voter suppression of African Americans in many states artificially amplifies it. So everyone here and abroad should be pitching in to make sure it doesn’t happen. Working on a related post for tomorrow. I will be watching from work on the PC all day during your election… Fingers and toes crossed! Good luck to you all! It is all down to the turn-out, now. I would really encourage people to pay attention to highly credible poll aggregators. Start with Dr. Sam Wang at PEC. His track record is superb. He has Clinton’s probability of winning at 98% or 99%. Don’t know how long he’s been at it but I’ve been on board since ’08, and having such accurate predictions to rely on has felt a bit like a superpower. A world beyond the crazymaking horse race approach of so much of the media. Could not recommend more highly. I sincerely hope that is the case. However, what I see in Florida, for example, is republicans leading by a slim 0.4 percent margin even as there’s evidence that democratic early voting ballots have been delayed/suppressed. In North Carolina, we see obvious African American voter suppression — with some counties that had 16 polling places during 2012 having only 1 in 2016. Of course, there are rumors that registered republicans in FL are voting 28 percent for Clinton. And if this is the case, it would support the aggregator’s predictions. However, the message I’m sending is that we shouldn’t rest on our laurels. It looks close now and we need to fight hard as if it really is — with fire in the belly and a sense of real urgency. We can’t afford a Trump presidency. Dr. Peter Ward, U WA Paleontologist and his colleagues studied the lead up to the first great extinction 250 million year ago. CO2 concentration likely a bit higher than 1,000 ppm…in the 72,000 year event. With the current annual CO2 increase, humans will have passed the halfway point in less than 30 years…2045. From 280 ppm, in 1880 to 500 ppm in 165 years and triggering positive feed backs from now on. Thanks for this, John. Noted. I saw the DiCaprio documentary and It make me think! How can we fight this! The words are: we must fight this. Wenda, and we CAN fight this! You will hear much doom-saying, but we still have time to avoid the worst for our children and grandchildren, if we act NOW. First thing to do: read this blog and the links here regularly, for accurate, up-to-date information on climate change science–there is a lot of outdated garbage out there. You will always get the real deal here. Learn as much as you can about climate change. Talk to people about climate change, if you can—some folks find that it’s difficult to talk about, as others just don’t want to know. Join with others to support local efforts to reduce carbon emissions. Demand action from our political leaders. Keep shouting at them until they get the message. It’s taking a while, but they are starting to realise something’s up with the planet. Support groups like 350.org, who are on FB. Try to reduce your own carbon footprint as much as possible—eat less or no meat, reduce consumption of all kinds, fly less, grow a veggie garden, plant trees, conserve energy, buy an electric car if you can, etc etc. Fantastic, Cate. Thank you. You rock! It’s helpful to cut the stuff out and healthier in any case. The center of gravity, though, is fossil fuel burning. We demonstrated atmospheric responses to a reduction in Arctic sea ice via simulations in which Arctic sea ice decreased stepwise from the present-day range to an ice-free range. In all cases, the tropospheric response exhibited a negative Arctic Oscillation (AO)-like pattern. An intensification of the climatological planetary-scale wave due to the present-day sea ice reduction on the Atlantic side of the Arctic Ocean induced stratospheric polar vortex weakening and the subsequent negative AO. Conversely, strong Arctic warming due to ice-free conditions across the entire Arctic Ocean induced a weakening of the tropospheric westerlies corresponding to a negative AO without troposphere-stratosphere coupling, for which the planetary-scale wave response to a surface heat source extending to the Pacific side of the Arctic Ocean was responsible. Because the resultant negative AO-like response was accompanied by secondary circulation in the meridional plane, atmospheric heat transport into the Arctic increased, accelerating the Arctic amplification. Confirmation of Francis and beyond. This may be the straw that broke the camel’s back. Also confirms a lot of the stuff we’ve been looking at in the observational record over the past few years. In other words, one hell of a report. It might just be my own confirmation bias, but I have the feeling that something has really shifted with respect to the arctic and weather, and it’s not going back to the way it was. The changes are no longer incremental. Yes, the ice rebounded after the massive melt of 2012, and after the massive melt of 2007, and we did have a similarly massive El Nino in 1998, but none of those years had the severely disrupted jet stream. If the Hadley cell, Ferrel and polar cells are breaking down, and the polar cell is no longer strong enough to keep warm moist air out of the arctic, the whole system could be in the middle of breaking down completely. The DMI 80N temperature chart has no previous year that is anywhere close to 2016, so the question is whether this year is a spike, and subsequent years will return to the linear trend, or if this year is a system state change. There’s a lot of discussion on the Arctic Sea Ice Forum about whether the transition will be rapid, or more linear. It’s really hard to imagine that 24hr darkness of polar winter won’t continue to freeze things up for a long time to come, but this Autumn is showing us that it might not be the case due to increased green house gases, open water absorbing so much more heat, the jet stream break down allowing much warmer and water vapour laden air to enter the arctic from lower latitudes. Wadhams’ prediction of sea ice loss by 2016 give or take 3 years is looking like a distinct possibility. Have you spotted Tamino’s assessment of atmospheric CO2 increases. His conclusion on the subject of the present rate of increase is – “All in all, the evidence suggests that the present long-term rate of CO2 increase is right around 2.25 ppmv/yr.” The rates of increase for present days, weeks & months are still being boosted by El Nino. But for that, September’s 401.03ppm, the result of a 3.4ppm increase in September 2015, would have been presumably depressed in excess of 1ppm and MLO would have then recorded a final sub-400ppm month (instead of the single rogue sub-400ppm daily reading of 29th August). MAR at 228: yes, I read Tamino’s posts on a regular basis and I looked at the one you referenced and wondered if, and hoped that, Tamino is correct and that the baseline CO2 increase number is around 2.25 ppmv/yr. I am not sufficiently grounded and knowledgeable about the CO2 cycle to project what the baseline number actually is. I can track hard numbers, unbuffered by potential modifiers, and review them against other time frames with similar modifiers and draw some conclusions/best guesses about what is going on. In the case of the impact of EN as a modifier, I can look back at 1998/1999 EN event for context. As the months go by and we see the most recent EN event in the past, we should see the increase number of current mo average drop when compared to the same month in 2015. At some point, we should be comparing a monthly average of non-EN numbers against past year of EN number and then we should see the month to month comparison differential drop, right? When I look at monthly averages from 1998 and 1999 and calc the differences, then I see increase showing in Jan 99 (2.94 ppm for Jan 1999 v. 2.14 for Jan 1998, then flattening off by April increase of 2.35 ppm for 1999 and 2.36 for 1998, then the numbers turn around with 1998 showing larger month to month increase from 1997 than are shown with 1999 compared to 1998. I am watching and waiting to see this happen in the month to month comparisons in the current EN event and we have not hit a flat month yet. The most recent month to month that I can work with is Sep showing 3.47 increase from 2016 compared with Sep 2015 which showed a 2.28 ppm increase from Sep 2014. So what I am seeing is that there is no flat month yet showing that the EN bump has started to subside. Once we hit a flat month we should then start seeing a reduction of increase in month to month annual comparison. It just has not happened yet, not even to the baseline increase of 2.25 ppm that tamino proposes. 1998 EN was followed by a 1999 La Nina event and that drove CO2 sat numbers down. We do not appear to be seeing a LN event at this time, so that probably keeps the CO2 numbers up a little higher than would be if we were duplicating the 98-99 pattern. 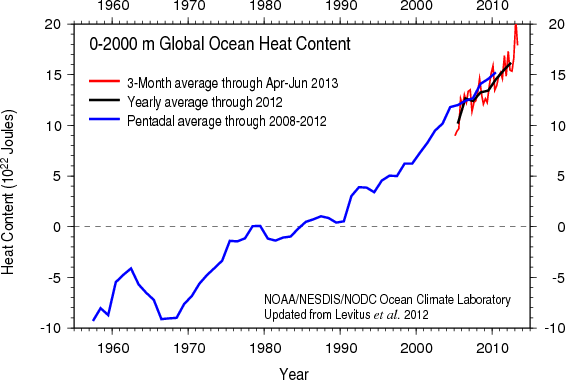 The bottom line is that we are now at 402 ppm and continuing to increase the CO2 number. This is a disaster. Pure and simple. We have to stop the increase or face more and more terrible consequences. There are no bailouts from this. We are poking the climate beast and that is pretty stupid given what we know about climate and the impact of higher atmospheric CO2. I don’t bother much with CO2e because my sense is that we are cooking ourselves with CO2, working on CO2e is unnecessary. The steps we should take to address CO2 can be adjusted slightly to address CO2e, but if we take no significant action, then worrying about CO2e is like worrying about being electrocuted after being hung. Are there live wires under the gallows trap door? Probably doesn’t change the gallows trapdoor outcome. Correction: 2015 jump was 3.05 ppm according to NOAA’s ESRL. 1992 was mainly the result of Pinatubo eruption in 1991. There is now a “lake” of poisonous, deadly brine underneath the Gulf of Mexico. It is filled with methane and hydrogen sulfide, both utter nasties we don’t want to be merrily bubbling up into the atmosphere. “It might seem weird to imagine a lake within the ocean, but things like temperature and salinity can change the density of water, and “lakes” of denser water can form within a larger pool. Scientists have recently discovered such a lake at the bottom of the Gulf of Mexico, but this lake also has something else very strange going on: All the creatures that enter it don’t come back alive, reports Seeker. a bonus for future fossil hunters …….im trying to find a bright side! miles, please don’t ever get gloomy on us. They have a video at the site, but I’ll post the vid here (I hope it shows!). Mysterious noises are emanating from the sea floor in the Canadian Arctic, and wildlife has disappeared from the area which is normally rich with wildlife. “The “pinging” sound, sometimes also described as a “hum” or “beep,” has been heard in Fury and Hecla Strait — roughly 120 kilometres northwest of the hamlet of Igloolik — throughout the summer. …. Guardian us briefing covers black voter suppression and the October surprise of FBI Trumplandia issue. No matter how bad a candidate Clinton is (and she’s bad for a lot of reasons) Trump would not be close without the systematic skew of the election dirty tricks. I don’t know what Obama should do about Comey. Firing him might just feed more backlash. You can’t wait until the 11th hour to address these things. I think it’s been clear with Florida in 2000 and Ohio in 2004 that our election system is a mess, yet nothing significant has been done. Voter suppression, gerrymandering, unlimited money in campaigns? This is not how you structure free and fair elections. It’s hard to fix that stuff. It’s easier to blame Nader et al. The Comey/FBI October surprise is a disaster and tragedy. Maybe it’s a violation of the Hatch Act, but I have never been a big fan of that legislation that is designed to keep the federal work force (a lot of union workers) from playing a role in elections. A Clinton presidency would be bad and a Trump presidency would be worse. No matter how this turns out, the big concern should be that so many US voters would think that Trump could work out as president. How do we fix that? Telling the Trump folks how stupid they are does not appear to be persuasive. This will be over soon. It’s already over for me, I voted weeks ago. Actually, I think a Clinton presidency would be a positive in that it would build on what Obama has already done. People saying a Clinton presidency would be bad are focusing only on ad hominem attacks, rumors, and puffed up scandals. Not on policy. Wall Street: C (economic policies support the middle class, but contacts with Wall Street provide some legitimate reason for concern). When you look at the basic facts of the matter, the comparison is laughable. I could go on with race relations: Clinton A, Trump F; overall adherence to American ideals Clinton B, Trump F; respect for the integrity of American Democracy: Clinton B, Trump F; and respect for women: Clinton A, Trump F.
Another factor I would add is risk for seriously destabilizing the country: Clinton: less than 1 percent, Trump more than 50 percent. Anyone claiming any kind of equivalency between the two has listened to too much nonsense and is basically generating a very misleading narrative. What about animal agriculture? Meat is a choice. I suspect the real problem with animal agriculture is scale. I think there are real problems with feedlot and factory farm models. There are also real problems for the global population with some folks eating so high on the food chain several times per day. There is also the species justice issue which motivates some of us to be vegan or greatly reduce animal product intake. Personally, I like milk, cheese, eggs and honey. I take extra steps to buy eggs from local sources where I can actually see the chickens and know that the eggs are produced in a manner that is not wildly exploitative. I think animal agriculture is part of our global food system, but the scale and techniques need to be integrated into a larger agricultural and species ethic that is reasonable. Pretty silly, but those are my thoughts on animal agriculture.